Find-a-Friend Friday is fast becoming one of my favorite things about blogging. I am so impressed with these women who see themselves as totally ordinary, but don’t they just shine in their interviews? Today we are going to meet Allison, who emailed me back and asked me if I would answer all the questions too. So I did, and she has posted *my* interview over at her blog today. So stick around here to get to know Allison, and then hop over there to learn a little bit more about me. It didn’t take me very many visits over at her blog to decide that Allison was a quality mother and woman. She is the real deal. She takes beautiful photos, and her posts are simple, yet like her blog title claims, inspirational. Here’s a link to one of my favorites of her recent posts. I think once you read a little bit more about her, you’ll see she really didn’t need much of an introduction from me. Blog world, meet Allison. I am left-handed as are all of my boys. John is right-handed as are all the girls (well almost we don’t know about Loafie yet.) I have yet to decide what I want to be when I grow up, so I have not graduated from a university yet. I think I might have the most hours for a senior ever. Before children 7, 8, and 9 I worked as a freelance artist in the scrapbooking industry both with manufacturers and magazines. I am currently exploring and designing digitally. I am the oldest of 5 children and according to my siblings I’m still bossy. I can’t wait to serve a mission again, this time with my darling John. 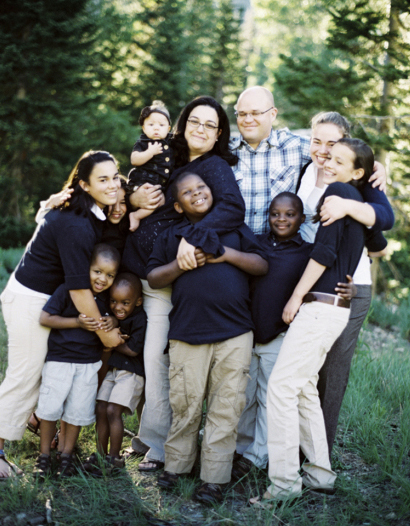 In fact I have asked every bishop we’ve ever had if he will accept our family as missionaries. We have been rejected every time. I love God more than I love my family, which is saying a great deal. I’ve told my children that if they are ever in a situation where they are commanded to deny God to save my life they better choose God. Hugs, kisses, “I love you”, reading together, snuggling, more kisses, working together, smiles and thank you’s, hugs from children who don’t like to give hugs, kisses on each cheek, talking and late nights, singing in the car (50’s songs are our favorites… we sing a mean “Wild Thing”), more hugs, more kisses, watching my children play and hearing their laughter. 1. Seeing all my children remain faithful in their testimonies of our Lord and Savior, Jesus Christ. 2. I would love to travel. Meet new people and see the beauty of the world. I’m very good at procrastination. I’m great at avoidance (check out my laundry room for proof). I’m amazing at self-deprecation (who needs enemies) and I excel in the art of guilt. Reading, quilting, cooking, photography, more quilting, learning something new. I have none. Really, just when I think I’ve figured something out with one child it suddenly stops working and it rarely works for another child. Wait, I just remembered something. If we don’t have scripture study as a family we fall apart. I’m not joking about this, especially if I make significant time in my personal study everything goes so smoothly. I think that the children were learning subconsciously because most are not awake during scripture study, but it still makes a difference. I don’t think there is anything. I’m an open book. I will open the front door and invite you in even if I’m still in my pajamas. Anything that comes out of the body that doesn’t land where it should (ie. vomit). Toilets, don’t like cleaning toilets. I also have a thing about emptying the dishwasher, not sure why. God lives. Jesus is the Christ. Faith, not fear. I am nothing with out a merciful Father in Heaven. *to remember the silly moments in our lives. *so my children will have a visual record of who they are and what we believe no matter where they are in the world. *to share the talents the Lord has given. *for parents who faithfully serve missions. *because it challenges me to be a better writer (still working on this one). *to stay connected to friends and family. *to remember how much I love my children on the difficult days. *because I love hearing my children talk about what I have posted. *to help me see the Lord’s hand in our lives. I love it. Thank you, Allison. i LOVE you Allison…You are my kind of woman! I want to grow up to be just like you…in about 4 years..hee hee!! Great pick, Steph! That was AWESOME! I can’t wait to get to know Allison and Stephanie! Allison has a spark of energy in her writing. She must have that spark with children. I was listening to Elder Nelson’s talk from October 2010 and he was talking about being a missionary and how the light would radiate from loving the gospel. Her writing expresses that light and she is a missionary now like it says in the Primary song “I Want To Be A Missionary Now.” Keep up the good work! I have read both interviews. Both of them are inspiring. I agree, this might be my new favorite feature. I am loving getting to “know” these women that I so admire here on blogland. Thank you for being the host and the “idea momma” of this amazing series. I love it. I am really enjoying Friday’s here. Heading over to Allison’s blog! Allison is every bit as real and wonderful as this interview! You have my word on it! She is my, dare I say it?, oldest cousin which translates into wisest cousin for me. I remember one summer when I was about 9 getting to sleep over at her house. She braided my hair all fancy, took time to talk to me, etc even though she was older (a teenager!) and had friends of her own who were asking for her attention. I have never forgotten that. I’m back to say how much I enjoyed reading your interview. When I moved back to Utah from CA, it took me a bit to make friends and find my grounds. I know how you feel and I hope you feel comfortable here soon. Good luck to your husband on the exam. Thanks for sharing all you do on your blog. I learn so many good things when I come here. Fabulous Woman! I am so glad you are doing these. My world has just opened up. Great to meet you Allison! Kimberly, you expressed my thoughts perfectly. Hey, this is a cool feature! Of course, reading about Allison’s awesomeness – as I’m sitting here in my workout clothes while my son is playing video games – makes me feel like just a touch more ordinary. She definitely sounds like someone I would want to be friends with.